Why Can't You Get A Nice Basic Car These Days? Remember the Chevette Scooter? 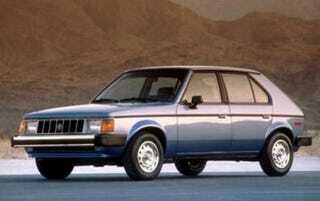 The Tercel EZ? The Horizon America? A couple of decades back, Americans had a pretty broad selection of affordable basic transportation with zero frivolous gingerbread. Not these days. As you saw in our Ten Things Your Kids Will Never Experience In A New Car and 25 Most Redundant Technologies posts, even the lowest of low-end cars intended for the North American market usually come standard with features once considered to be luxurious extras. Power windows. Keyless remotes. Air conditioning. If you're a super-cheapskate who doesn't want to pay for those bells and whistles, you're pretty much out of luck. How did it come to this? Why did power windows cost more than roll-up windows in 1973? It's easy to understand; it took a man, or a team of men, earning the aforementioned living wage, longer to build, assemble, and install power window components. In 2009, the whole deal is "subbed out" to a supplier who produces snap-in power window assemblies. It's usually cheaper to get 100,000 power window assemblies than it is to get 50,000 roll-up assemblies and 50,000 power assemblies, plus you don't have to train the $12/hour temps who (don't tell anyone!) actually do a lot of "low-skill" jobs on American assembly lines how to install two different kinds of window assemblies. The door can be made simpler because it doesn't have to accommodate two different kinds of controls, which leads to more volume discounts, and so on.